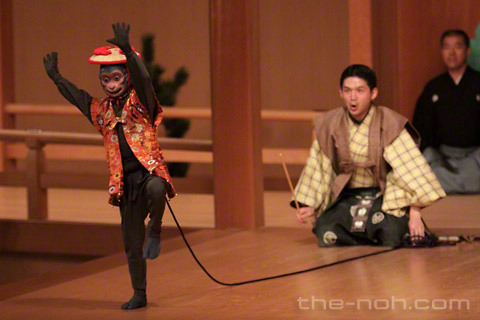 the-noh.com : Introducing the world of Noh : What is Kyogen? | Home | World of Noh | What is Kyogen? Being a stage art that share's noh's roots in sangaku, kyōgen has had deep links with noh since early times. The main difference between the two forms is that kyōgen is connected with laughter, which is an emotional state not usually expressed in noh. Because sangaku was characterized by comedy, one can say that it was kyōgen that inherited and carried on sangaku's original form. Kyōgen apparently first emerged as an independent art form during the Warring States period (1467-1568), when it already began appearing on performance programs alongside noh. Broadly speaking, there are two kinds of kyōgen: hon-kyōgen, which are discreet plays performed between noh plays; and ai-kyōgen, or simply ai, which is performed during the interludes within noh plays an is thus integral to the noh plays themselves. The term “kyōgen” used by itself usually refers to hon-kyōgen. Hon-kyōgen generally involve two or three actors who lead the audience to gentle laughter through dialogue performed in a conversational style, and through carefully honed gestures. In most cases, ai-kyōgen are performed by a single actor, who performs the important role of facilitating the smooth progression of the story of the noh play in which he appears, and deepening audience understanding. As used today, the word “kyōgen” refers to the comedic stage art being discussed here. This has not always been the case, however. The roots of the term lie in China, where it was used to indicate either a joke or something divorced from reason or normal convention. In the Manyoshu, an 8th century collection of Japanese poetry, the Chinese characters for “kyōgen” were read “tawagoto", which means “silly talk.” Thus the term was familiar to the Japanese for many centuries before it began to be used in connection with the stage art. During the Heian period (794-1185), the phrase “wild words and fancy language,” which appeared in the writings of the Tang poet Bai Juyi, was included in the Wakan Roeishu (“Collection of Chinese and Japanese Poems for Singing”). The “wild words” referred to in this phrase are a translation of the term “kyōgen.” Subsequently, the term was used to condemn stories and utterances that, from a Buddhist perspective, were false or full of empty ostentation. Gradually, the term that had been disseminated as meaning nonsense, a joke, or something divorced from common sense took on the meaning of “comical,” ultimately coming to refer to the stage art of kyōgen. Sangaku, which entered Japan from China during the Nara period (710-784), was a popular entertainment that included such elements as comedy, mime, acrobatics, juggling and magic. During the Heian period, sangaku came to be called “sarugaku,” with an increased emphasis on comic elements. The main thrust of the art came to focus on the comical trials of country bumpkins who find themselves at a loss in the capital. Noh developed and changed significantly through the addition of song and dance and a shift in emphasis to the aesthetic of yugen, while kyōgen continued the sarugaku tradition of comedy. Although the origins of kyōgen are unclear in many respects, kyōgen actors called okashi first appeared in historical records in the middle of the 14th century. Zeami himself referred to kyōgen actors as okashi, and it's recorded that they belonged to performance troupes and performed in alternation with noh actors. It appears that the kyōgen of Zeami's time was primarily a rather vulgar, improvisational art with a fair amount of sexual innuendo. As the years passed, however, it gradually became refined into a regular repertory, with script books first appearing sometime in the second half of the 16th century. After a fluid period during which there was ample interaction among various actor groups, two schools in particular won support from the shōgunate in the Edo period (1603-1867): the Ōkura and Sagi schools. A third group, the Izumi school, had the support of the Owari Tokugawa clan and was active primarily in Kyoto, Owari, and Kaga. Once it became a performance art of the shōgunate, kyōgen lost much of its improvisational character and began to focus instead on stylistic beauty. Like noh, kyōgen temporarily declined drastically with the Meiji Restoration of 1867, bringing about the unfortunate demise of the Sagi school. The Izumi and Ōkura schools recovered, however, and have continued their traditions down to the present day. Thanks to the highly motivated efforts of kyōgen actors after World War II, their art is currently enjoying quite a boom in popularity. All-kyōgen programs are now often presented not only on noh stages but in civic halls and other venues. Just as the mainstream sangaku did in its own day, kyōgen today has generated considerable power as a well-loved stage art of the people. Kyōgen speech is based on the ordinary speech of Muromachi-era (1336-1573) Japan. It consists of broad dialogue accompanied by mimetic, sometimes exaggerated movement that is very finely controlled. The usual goal of kyōgen is to inspire laughter. Zeami urged kyōgen actors to avoid vulgar and crude material in favor of a lighter, gentler fun. To achieve the laughter worthy of the term “mad words,” kyōgen is characterized by a refinement that avoids sarcasm and tends to integrate two elements: rhythmical language and movement, and a depth of characterization and story. Kyōgen's range extends beyond simple laughter, however. It has a depth of feeling that can also portray sorrow, sympathy and nostalgia; deliver pointed satire; and explore philosophical questions regarding human sexuality. Sharing the same formal beauty as noh, kyōgen historically incorporates other performance arts such as dengaku and kusemai as well as popular song, resulting in a great richness of expression. There are about 260 kyōgen plays in the combined repertories of the Ōkura and Izumischools. A wide variety of characters appear in these stories of everyday life, ready to inspire laughter through the use of skit-like structures. In Kōji, for example, the protagonist is a servant who eats his master's tangerines and makes humorous excuses to avoid punishment. In Inabadō, the hen-pecked husband of a sake-loving wife seeks escape from his miserable marriage; in Utsubozaru, a monkey trainer pleads with a feudal lord to spare the life of his young monkey, which the lord wants to kill in order to make a quiver; in Inomoji and other plays, men express their desire to find wives; in Kakiyamabushi, a mountain priest steals and eats a farmer's persimmons; in Hagi Daimyō, a rustic feudal lord goes out on a sightseeing tour; in Shūron, two priests belonging to different Buddhist sects meet on the road and fall into a doctrinal dispute; In Tsurigitsune, an old fox who has lost all of his relatives to a hunter's trap assumes human form to try to convince the hunter to stop killing; and in Kazumō, the spirit of a mosquito appears as a sumo wrestler in order to find a fresh supply of blood. This is just a small sample of the many characters that can appear in kyōgen. Each tale is skillfully told through finely honed words, movement and gestures to create a fascinating and funny theatrical experience. Most plays involve two or three actors and last 15 to 20 minutes, but there are also ambitious pieces that last more than 40 minutes, as well as some that involve ten or more characters. The repertory can be divided roughly into the following categories, depending on main character and content. God of Fortune Kyōgen plays in which the God of Fortune bestows good fortune. Farmer Kyōgen plays about farmers pay their taxes. Feudal Lord Kyōgen Plays that feature daimyo feudal lords. Minor Lord Kyōgen Plays about the servant Taro Kaja. Son-in-Law Kyōgen Plays in which a son-in-law does various things related to his wedding. Woman Kyōgen Plays that feature often strong-willed women in the main role. Demon Kyōgen Humorous depictions of demons or of Emma, the King of Hell. Priest Kyōgen Plays in which priests become the object of ridicule. Mountain Priest Kyōgen Plays about mountain priests with imperfect magical powers. Blindman Kyōgen Plays featuring blind masseurs and similar characters. Dance Kyōgen Plays that have a noh structure and are parodies of noh plays. Miscellaneous Kyōgen Plays that don't fit into any other category, often with animal protagonists. As noted above, ai-kyōgen are kyōgen interludes within noh plays. They perform a crucial role in advancing the story, and are generally found in two types: katariai (storytelling interlude) and ashiraiai (interactive interlude). The most typical storytelling interlude is the igatari, or “sitting story.” This is often used in two-part mugen (phantasmal) noh and other noh in which the shite exits after the first half. Usually, the kyōgen actor plays a local person who presents the essence of the noh's story through an extended monologue delivered while sitting on his knees in the center of the stage. The story is cast in language that is relatively easy to understand, and often includes episodes or background material that is not mentioned in the noh proper, thus helping the audience achieve a deeper understanding of the story while setting the scene for the reappearance of the shite in the second half. Other types of ai-kyōgen that fall into the storytelling category include masshaai (branch shrine interlude), in which the god of a small local shrine enters to the accompaniment of hayashi music; hayauchiai (fast beat interlude), in which the performer enters quickly to the rapid beat of a drum accompaniment called hayatsuzumi (rapid drums); and gekiai (dramatic interlude), in which several kyōgen performers appear together and perform a dance or skit. Interactive interludes are often found in genzai (real world) noh, in which the kyōgen performer helps to advance the story by interacting directly with the waki and shite. In the play Dōjō-ji, for example, the kyōgen actors play temple acolytes who admit the shite, a dancing girl, into the temple precincts despite orders not to let any women on the grounds. In Kurozuka (also known as Adachigahara), the kyōgen actor is a member of a priestly entourage who, despite repeated admonitions not to do so by the head priest, peaks into the bedroom of the woman hosting them, discovers her true nature as a man-eating demon, and sounds the alarm enabling all to escape. Interactive interludes are thus often used to develop large scenes. 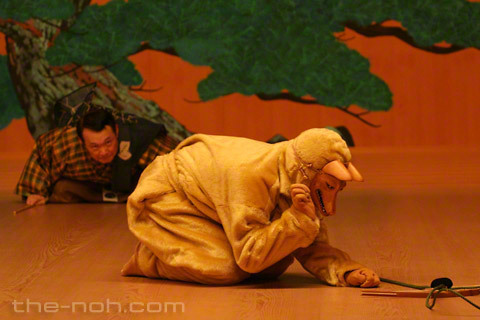 Sometimes, however, they also appear at the beginnings of plays in a form called kuchiakeai (mouth opening interlude) to set the initial scene. An example of this is found in the noh play Hanjo, in which the mistress of a brothel, played by a kyōgen actor, expels one of the girls in her establishment because of her preoccupation with a lover who has left her behind. Sanbasō is the main role in the second half of Okina, after the old man Okina exits. The actor begins by dancing the momi no dan (rubbing section), after which he dons a black, old man's mask and dances the suzu-no-dan (bell tree section). The choreography involves a great deal of stamping, and there are also mimed movements that portray the sowing of fields. The actors are thought to become gods as they perform their dances of supplication. Kyōgen performers use the verb “stamp,” not “dance,” to describe what they do when they perform Sanbasō.